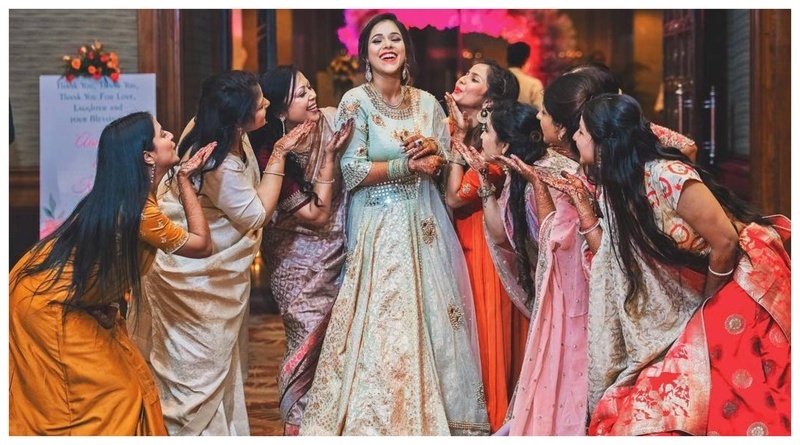 “It all began 8 years back in school," says the bride-to-be Aanchal Goel the face of My Multi Faceted Diary, who took the first step toward her marriage with the roka ceremony. Aanchal and Kunwar both hail from different communities, and like any normal desi-family, they had to face the ‘marry in your own community’ thing too. But their love for each other was too strong to be caught up in any of this. This much-in-love couple stayed firm and surpassed all the obstacles that came their way. “Little did we know that we would thrive and survive all the difficulties, and our madness would lead us here,” says the overwhelmed bride-to-be. Aanchal grabbed all the eyeballs as she walked in her teal-blue lehenga with mirror work on the choli and golden print work on her lehenga skirt, paired with a sheer dupatta with motifs on it. She completed the look with matching bangles, statement earrings, mermaid braid, dramatic eyes and a deep red on her lips. Kunwar looked dapper in a black suit paired with statement moccasins. With the Roka pictures coming to an end, we can’t help but wonder what her other wedding ceremonies be like. Here’s wishing the much-in-love couple, a lifetime of togetherness!